In an alternate future not far away, Norwegian scientists develop the technology to shrink humans down to size. All problems are a mere fraction when you’re six inches tall. Your bank balance that could barely afford a two-bedder now buys you a Mega (two-foot tall) McMansion with all the trimmings. It helps too, that downsizing your life downsizes your carbon footprint: a bourgeois dream come true. 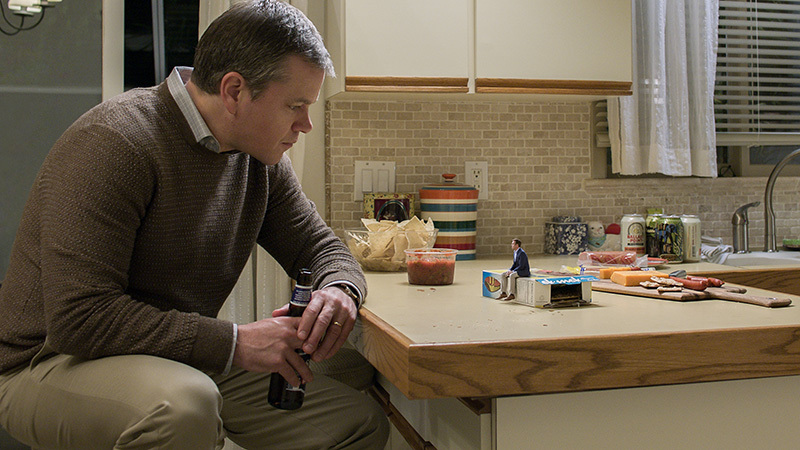 Into this Swiftian adventure steps Paul Safranek (Matt Damon), a slice of middle America right out of Omaha. For a small price, and a permanent commitment to staying small, Paul decides to make a fresh start. But on the other side of the shrink ray, all is not as promised. Paul’s Lilliputian Leisureland is comes at a cost, and ultimately, Paul discovers that going small is no true escape from the problems of real life. Alexander Payne’s seventh feature is a meandering sci-fi morality tale whose naive hero finally, through his experiences, grows wise. I’m doing you a solid by giving you this character arc upfront, because without it, it’s often quite unclear what exactly was going on. That’s not to say there isn’t much to enjoy. Christoph Waltz playing Christoph Waltz is an excellent distraction to any film, even when the purpose to his character isn’t entirely clear. Hong Chau’s Vietnamese refugee will ignite debates about whether she plays a racist caricature. Spoiler alert: she’s not.